Mud and ruts are seen on East Waldo Road in Waldo, March 2, 2017. Waldo residents that live along the East Waldo Road admit it can be hard to travel in mud season. Living along the road, they said, is something that can bring neighbors together. "We all talk about the road," Deb Burwell said. 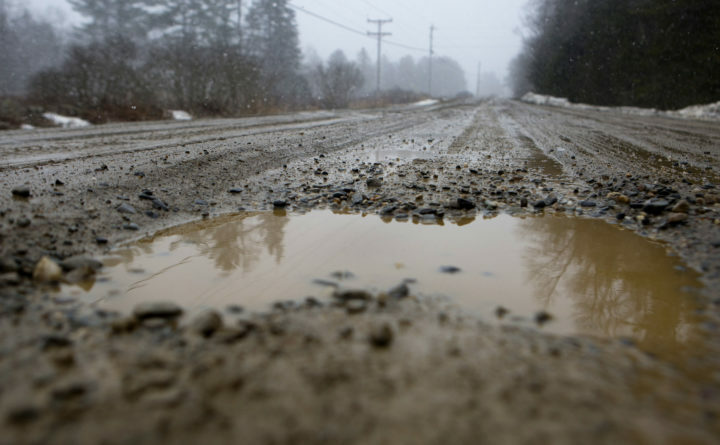 Freedom Selectman Steve Bennett is no stranger to hearing complaints about the town’s dirt roads in mud season. This year, though, the roads have seemed muddier and tempers more frayed than usual. At last Monday’s regular meeting of the Board of Selectmen, nearly 20 residents spoke up, sometimes angrily, about their safety concerns over nearly impassable roads. Mud season in Maine, sometimes called the state’s “fifth season,” generally occurs between March and late April or early May. It happens when the snow and ice start melting. All that extra water leads to a lot of mud. This year, the long freeze-thaw cycle that has dogged a wide swath of the state seems to have hit roads harder than usual. Paved roads have sprouted a bumper crop of potholes, and dirt roads are no better. The mud is deep, the texture often seems more like Jello than hardpan and the damage it can do to your car or your peace of mind is real. At the meeting, he and other officials heard from a day care owner whose business is taking a hit because parents are afraid they will get stuck while dropping off and picking up their children. They also heard from a resident who was upset about a car that got stuck in a muddy road, according to the Republican Journal. Mainers have been contending with muddy roads in the spring likely for as long as they’ve driven vehicles. Bennett recently described a photo from the 1940s that showed the set-up that a clever local postman used to ensure he could deliver the mail in mud season. Pem Carter, who delivered the mail in Freedom for 45 years, fitted out his Model A Ford with airplane tires — so big they would, one presumes, skim over the muddy roads instead of getting bogged down in them. In the town of Waldo, the sloppy roads recently proved irresistible to the driver of a pickup truck who evidently treated the East Waldo Road as if it was a true mud run. The driver went fast and spun his wheels, apparently intentionally, according to longtime First Selectman Kathy Littlefield. Distressed neighbors reported the incident to authorities, and police were called to look into the matter of the destructive driver, she said. That person’s actions did not help the state of the road, well-known among locals as being difficult to navigate during mud season. But the East Waldo Road is not unique in the town. Littlefield, who lives on a dirt road herself, needed a lot of adjectives to describe the state of the town’s roads during a freeze-thaw spell last weekend. She has heard of cars getting stuck in the roads this year, and did call the RSU 3 central office to let school bus drivers know that the mud is a problem. Littlefield said that if she ever won the lottery, she’d like to have the roads in her town paved. Doing that right is an expensive and fairly complicated enterprise. But for now, folks in her town are coping with the roads as they are. The town has been hauling in loads of stone to try to stiffen the muddy roads up, and it seems to be helping, she said.